grailrunner | Dreams are engines. Be fuel. Designing a tabletop wargame…come and join us! Tabletop wargames like Warmachine and Warhammer 40K have a lot of PRO’s: The strategy and tactics stretch your mind to be inventive and surprising. You have to anticipate and react to shifting conditions and take advantage of the terrain. It’s primal war in a bottle. However, although the miniatures look amazing laid out in full glory on rolling hills or nestled in masonry ruins on the table, it takes a lot of $$$ and time and talent to make that happen. All too often, the aesthetic you saw in the pictures doesn’t turn out that way on your own table. And the endless battles…some of us are a little more intrigued by the lore and fluff behind games than the games themselves, so comparing a wargame with something designed to tell stories like Dungeons & Dragons can weaken your enthusiasm a bit. I mean, WHY are they fighting this war, right? And again. And again. Trading card games like Magic: The Gathering bring their own PRO’s: Incredible focus on lore and shifting mechanics, gorgeous and inspiring art, creative engines uniquely geared to tell stories, and a maddeningly well-designed game. Seriously, go listen to this discussion on how Wizards Of The Coast goes about their worldbuilding – it’s an impressive operation! And the art on Magic cards is typically the thing that people mention as drawing them into the game in the first place; and it’s amazing art, no doubt. A couple of artists you might look into from their usual suspects are Richard Wright and Adam Paquette. However, Magic brings a lot of complexity to it, and a lot of story baggage. Pick up one of their art books like the recent one based in a massive city called Ravnica and you’re bombarded with lore that, while interesting, is difficult to relate to and to remember. The game itself has morphed into a pay-to-play monstrosity where the guy who spent the most on the more powerful deck will often win the game. And even in a casual format, it’s still just a card game and doesn’t have the feel of staring down a tabletop canyon with a horde of miniatures rushing at you where you hadn’t anticipated. We started asking ourselves at Grailrunner, is it possible to combine some of the best of these? Every single character, weapon, and vehicle has a backstory. Nothing is given as plain vanilla fluff. Even the scratches on a cannon barrel came from somewhere. That’s the manifesto. We’ve got an initial set of rules and some strawman cards for two factions. Playtesting has been fun – games last about an hour. It moves quickly, and shifts dramatically. Luck is an element, as you draw each turn. Strategy is more important. Throughout this year, we’ll be testing things out with you here or with volunteers. We’ll post the rules and some cards soon to get your feedback. Keep an eye on this page for updates. If there’s enough interest, we will likely do a Kickstarter and initial print run. We don’t intend to become a gaming company though, so let’s keep our eye on the ball. The entire point of this site and Grailrunner’s vision is to inspire better fantasy and science fiction. This experiment just struck us as an interesting means of doing just that. 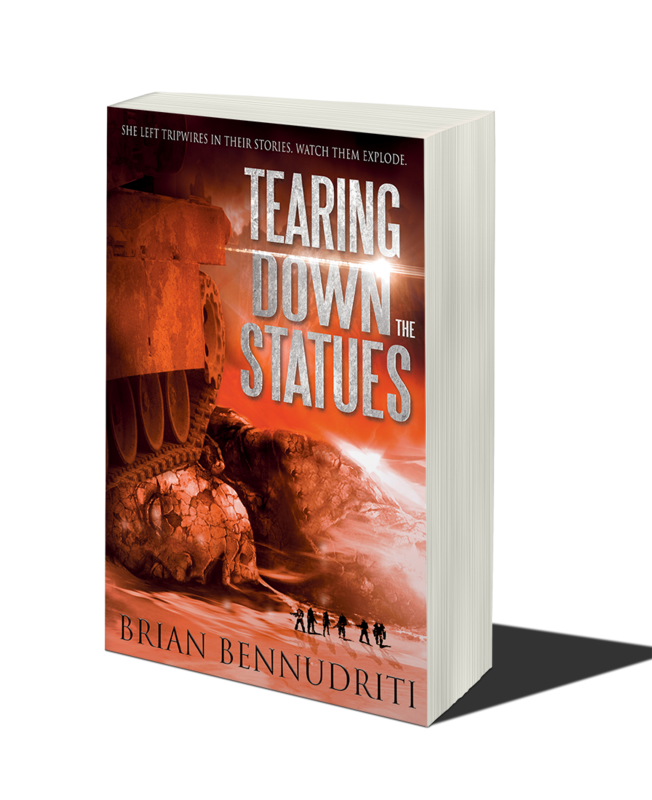 Just wanted to highlight an interview with our showcase author, Brian Bennudriti appearing in ‘First Saturday Sci-Fi’ by Tegan Maus, author of The Chronicles Of Tucker Littlefield series by Tirgearr Publishing. 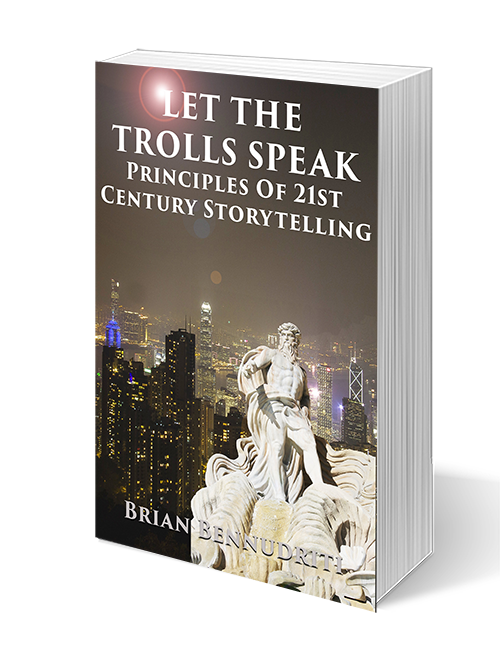 Brian: “Dialogue makes or breaks any book for me. The slickest concepts, the best setup and background, even an interesting hook in the first few pages – that’s all target practice if the people speaking sound like they’re telling me the plot. I can close a book two pages in if it’s hollow and obvious conversation. On the flip side, somebody like Nick Hornby can make the words pop (I know, not sci-fi, let me make my point). RA Lafferty and Neil Gaiman come to mind, although I pay close attention to Joss Whedon and Kevin Smith’s comics as a model to follow for dialogue. Humor’s okay, even in tense situations when characters are supposed to be afraid because that’s real. If you ask people their favorite bits in movies or books, more often it’s the softer character interactions than blow-out battle scenes. “I also very much appreciate a strong, innovative, but simple concept. Asimov’s Foundation series, and Clarke’s Rendezvous With Rama and ’Foundations Of Paradise, are standard-bearers for this. I’m just spit balling here, let’s look at the kind of one-liner punch I’m talking about. “Robert Metzger’s Picoverse: A lab at Georgia Tech accidentally created a sub-microscopic universe, so they’re going inside. “Greg Bear’s Blood Music: The fellow that created self-aware biological cells injects them into himself. “Barrington Bayley’s The Fall Of Chronopolis: An empire that spans across time rather than space is besieged by a mysterious enemy from frontiers in its future. And maybe go try this one by Tegon, available at Amazon. You may know if you’ve been here before how we feel at Grailrunner about blowing out walls in your imagination, squeezing some light into the cracks and crevices where amazing things can happen…if you think differently. That’s the whole reason for this site, in fact. I mean, read our manifesto. So just go to Amazon and buy this now if you don’t have it. Then come back. It’s the collected fictions of Jorge Luis Borges. Looks like this below – Start with ‘The Garden Of Forking Paths’ section. Borges was Argentinian and an earth-shaking writer of fantasy. In his autobiographical notes, he said, “If I were asked to name the chief event in my life, I should say my father’s library.” You’ll find in this tome a story called ‘The Library Of Babel’ where he carries the idea of a large library to its logical extreme: all possible books in an infinite space. Honestly, friend, that’s everything great about Borges right there. He takes a concept, stretches it in every direction to make of it something fascinating, then sneaks around to look at it from the other side. I wish I could drink coffee with him. He reveled in smacking you with a twist concept at the end, often with his final sentence. Read ‘The Circular Ruins’ to see what I mean. It’s super short, you’ll love it. Also, try ‘The Approach To Al-mu’tasim’ – in that one, the blow comes in the extreme last sentence, in a footnote even! I’m sorry, I just find that kind of cerebral twist fascinating. In ‘Tlon, Uqbar, Orbis Tertius’, the conceit is that of a random quote from a friend. The narrator asks where it came from, triggering a surreal search for the mysterious (maybe fictional?) geographic origin of the guy that said it in the first place. A flip occurs at the end that turns the whole thing on its side. This is why you read Borges. I won’t go on, because you should be reading him now, not me. The idea, as always for writers, is study him. Read his method, his approach. See how he leads you along with the framework, then pay close attention to how he stretches everything to an extreme or turns it around at the very end. It’s high-minded and a thinking person’s game. And Borges gets in your head. He’ll stick with you long after. Yeah, we’re at part 4 and the conclusion of an experiment in immersive storytelling. Scroll down or click as appropriate for the previous editions, or just catch up quickly in the recap page. Two armies arrived at the same time, a force of electrical knights known as Cygnar, and an undead and sorcery-driven army called Cryx. Read on to see what happened. Click on this link if you prefer a pdf. Black Ruins Massacre pt 4. So Agathia’s sorcery and ferocious boldness granted her more of Major Maddox’s blood; but none of it has been enough. Cygnar’s return blows will be terrible. The Bane Witch is powerful, yes…even deadly in close combat. But she is overwhelmingly outnumbered and outflanked. Cygnar is closing in for what will apparently devolve into a war of attrition and running, relying on long range sorcery. Unbelievably, Agathia bets it all on another suicide run! She races to the central wall, vanishes like a shadow, and appears in the very heart of Cygnar’s strongest forces. Yet, she’s in range of Major Maddox, who was already wounded by the Deathripper’s previous sneak attack and the gang attack by the Satyxis Raiders. I honestly had no idea going in why that temple was split. It’s just how the foam pieces fit together into a pattern on the table. Looked cool. Also didn’t know who would win the fight or what tactics would be necessary. Each turn, I just hit the other side as hard as I could with everything I had. Maybe there was no surprise element; but there was definitely ferocity. This was intriguing. And it was a fun diversion through the holidays downtime. The game mechanics made the story line a bit frustrating at times, when I got hooked on an idea I wanted to see play out and couldn’t quite make that happen. But no cheating, man. No cheating. I just let it roll. Actually, I was happy to see the Bane Witch win this one. That very much fleshed out the resolution nicely when I dreamed up the answer for the mysterious two halves of the temple. Not sure what the answer would have been had Major Maddox won. I really appreciate the kind feedback and suggestions. Thanks for all the interest. We probably won’t do any more of these unless you guys really push since it was just an experiment. Glad you had fun, though. You’ve found part 3 of an experiment in immersive storytelling where we’re letting the mechanics of a popular tabletop steampunk wargame drive the narrative within a given framework. Part 1 and part 2 are available; but you can catch up by just reading on as well. And that’s where we are. I’ve allowed the battle to play out, just following the game mechanics and trying to stay as objective as possible each turn, playing out the most ruthless tactics and strategies available at the time. When I’m playing a side, there is no mercy or hedging. It’s ruthless, till I step the other side of the table and have to switch sides again. Soon, I’ll have to return to the mystery of the black ruins and that weird central wall, the mysterious statues that appeared from the fog. (I actually needed the time to make the terrain piece that will drive that part of the story). It’s not interesting to me to have something relating to the story arc affect the battle though, so we’ll have to see how that fits back in as things progress. I appreciate the feedback and interest from so many of you, thanks for that! Glad you’re enjoying it. Click and read part 1, dude. You’ve come across an experiment in immersive storytelling, relying on the game mechanics of a popular tabletop wargame to frame a steampunk and fantasy story. Not fan fiction, just a different mechanism for deciding what happens as the general plot unfolds. Unfazed by the mystery and unable to investigate when slaughter awaits them, Cygnar entrenches for the Cryx assault, poised in a defensive cluster on the west and protected from Raider charges on the east. Gun Mages advance and draw first blood! Undead Bane Warriors pass like ghosts through the wall and attack. Satyxis Raiders, magically enabled to do the same ghostly maneuver, make a surprise move and split their forces, four of whom attack the Stormguard from behind. Another clash brews on the east side of the temple, with six Raiders and a Slayer only steps away from Cygnar’s most dangerous weaponry, and a rushing Reaper with its harpoon raised high atop the wall. Honestly, I didn’t see the diagonal maneuver by the Raiders coming until it came. At this point, I’m excited to see that Reaper blast somebody from the top of that wall and haul them up for a beating. And maybe those Raiders have a chance to gang up and do some damage on the warjacks. We’ll see about that. And what’s going on with those statues, by the way? A ruined temple split into two parts suddenly overseen by statues of hideous entities that appears from thin air? Crazy. Hey, did you ever have an idea come to you fully formed with very little clue where it came from? An idea that you thought was amazing, but it just showed up uninvited as a very welcome guest? It happened to me a long time ago in a London hotel room one morning. My eyes popped open for no reason; and I could see a drawing on a white card: the side view of a futuristic vehicle that could ride up the side of vertical walls. It had ridged tires with flights on them at the ends of articulated arms like you’d see on an excavator. All of this, I assumed, made it easier for this vehicle to traverse uneven surfaces like a mountainside cliff or the outside ledges of a building. The vehicle had a name; and it even said so on the bottom of the imaginary card: mog. The name came from a dream I had when I was 12 or 13 of a green horse named ‘Mog’ that rode me around my neighborhood. Was awesome, but I hadn’t thought of that dream in forever. Still don’t know what my head was doing that night to connect all this together and dream up this vehicle. However, I loved it. I sketched it as best I could (I’m no artist, unfortunately); and there it sat for years. Flash forward – I bought my son a Christmas present one year of an ‘Air Hogs’ toy with a remote control car that had vaccum action to stick to the walls. Honestly, not a great toy; but it reminded me of that concept. The mog. So when I finally got serious about my first book, ‘Tearing Down The Statues‘ I of course had all kinds of people riding these things. I made it central to the book because that’s the whole reason you write things, yeah? To bring these things into the world! In fact, there’s a battle scene on the sides of buildings that made me chuckle out loud as I was writing it because it was so much fun. For the big scenes at the end of the book, I added a mad and desperate dash of a small squad of mogs on a suicide mission. I mean, how could I not? I’ve always wanted to visualize this thing somehow; and recently I had the opportunity in an unexpected way. Mainly because I’m a horrible procrastinator when it comes to writing. Seriously, I love doing it. I love having done it. Yet I chase shiny things in the tiny bit of free time I’m allowed. Photoshop, Poser, and Zbrush are three pieces of software that go together pretty well if you have patience, a ridiculously restless imagination, and inadequate artistic skills. I took my first shot at a full visualization of the mog; and that’s the image included on this post. Be kind, I’m learning. I built the cockpit and body of the mog in Zbrush by pulling in a ready made spaceship body from Poser’s content library as an ‘obj’ file. I tweaked the shape a bit, then started adding the legs as subtools based on deformed cubes. Still in Zbrush, I built the wheels by monkeying around with an extruded gear shape. Maybe not exactly what I saw in that flash of inspiration, but close! That done, I imported (via the ‘Goz’ plugin) the file into Photoshop, combining it with a stock photo of the side of a mirrored building. It looked gray and fake and flat. Not cool. The machinery texture on the front of the mog was also a stock image, warped in Photoshop to fit the space. I painted the headlight, side lights, and red stripe on a layer by themselves, then added a ‘layer style’ outer glow to make them pop. If I was a better artist, I’d have worked more on that stripe; but we’ll let that pass because I was digging what I was seeing by this point. Mirrors everywhere, so I knew that had to be sorted out with reflections and shadows. The shadow was just another ‘layer style’ – drop shadows adjusted for their direction and opacity. I made the reflections by copying the mog layers, reversing them on a separate canvas, jacking down their opacity, and bringing them back in upside down. Had to layer mask to clear out the reflection from the lines between mirrors. Again, not Da Vinci; but serviceable. I built the little guy in Poser based on some face and body morphs of the stock ‘James’ character in the software, moving the camera down to look up at him so it would seem like you’re staring up the side of that building. I’m curious what you think, although this is all just for the sake of learning new skills and seeing something I believe I brought into the world come to life in a new way. And honestly, looking at this picture now, I wish I could have more fully formed ideas pop up on their own like this one did. It was an amazing experience. And I’m a little jealous of that dude riding that thing!